Regensburg is a wonderful, quaint city about an hour drive north of Munich, known for its many bars and restaurants. Waaaay back when we lived there, one of the Italian places (Dolce Vita) we went to on a pretty regular basis inspired us to make these little, so very yummy, appetizers. Which back then I couldn’t quit eating and thus sometimes had to skip the main dish. They called them “Panini Speciale”, but would not for the life of them share with us how they did them…of course not. We girls used all our charm to smooth talk the cook, however the only hint he gave us was: the dough would be quite similar to a good pizza dough. So really, we’re uncertain about their actual name and whether or not they are indeed made the way we found works best. It is also a great snack just with wine, San Daniele prosciutto, manchego cheese and olives. Lightly mix yeast, sugar and lukewarm water. 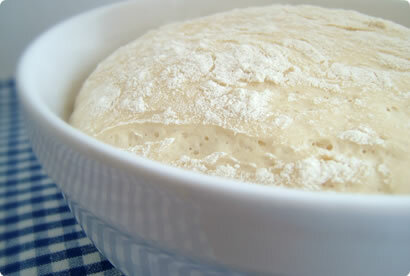 Put the flour and the salt in a separate mixing bowl, add the olive oil and the yeast mixture. Knead by hand or use your favorite kitchen aid and add more flour as necessary to keep it from sticking – until it becomes smooth. Dust with flour, cover with a clean dish towel and allow dough to rise in a warm place (for about 30 minutes). Briefly knead dough again and roll out to one finger thickness. Now cut the dough in small squares (or any other shape), at least 1×1 inch. Heat up olive oil at medium heat in a pan (use enough oil, so the dough pieces will swim). Add thyme or rosemary twig (whichever you like more) and garlic. Fry them until they brown and remove. By now and with the aroma spreading throughout your kitchen you should be fully convinced that this will turn into a fabulous appetizer. Finally add the little “dough cushions”. Let them fry for about 2-3 minutes, watch them grow and become all fluffy, and then turn. Once they take on a light golden color, drain them on a sheet of absorbent paper. That’s it. These delicious antipasti are best eaten warm! N.
Man könnte auch versuchen, den Teig längere Zeit kalt gehen zu lassen oder nach dem Gehen im Kühlschrank zu retardieren, das bringt auch bei Pizzateig geschmacklich durchaus etwas. I just stumbled upon your site and felt the need to tell you both how lovely I think it is. I will have to pick a recipe out now and give it a try. Oh, I love these! They serve them as 'dough balls' with garlic butter in England (Pizza Express restauranat chain). I always wondered whether they are baked or else. First of all, hi! Nice to see someone else blogging from Germany. 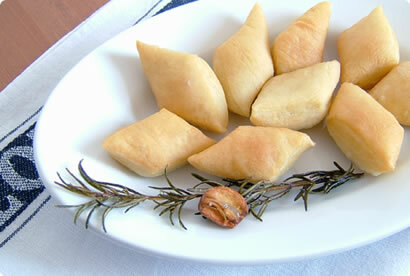 The little balls of fried dough are quite common throughout southern Italy. They're used as antipasti, sold as street food or even become part of fritto misto (a mixture of fried morsels). You can find them under different names (like paste cresciute, pittole and so on) depending on where you are. The recipes I have and use produce a wetter dough that can be either spooned into the oil or sqeezed through tumb and index to make little balls. For an even better taste, you could follow Petra's good tip or use very little yeast and long rise time, as Nepolitan pizza tradition calls for. Oooh...those look so yummy! I can't believe they're pan fried though - they don't even look oily. =) I better not make any of those or else I'll gain a few lbs in no time. Great blog by the way! 1. You should create a mail/feedback form, for users to contact you besides leaving comments. 2. You should activate RSS feed, these days, one has to wonder a thousand blogs, and opening them all with a browser is just impossible besides boring. So activating your WordPress RSS feature might be a good ideia to have some more readers. Just a "Keep up the good work!" We thought about #1 and decided to not have a direct email link on the website for spam reasons. However, on the about page we have it displayed in a spam-safe way. As for RSS, you're right we don't have an explicit link to the RSS feed, yet it is turned on (/rss). Since most RSS capable browsers show the RSS feed automatically and allow to subscribe to it, we have not included it on the front page. Aren't these pittole great? I make something very similar, too, I first ate them in Italy. My fave way to eat them is with some lardo (di colonnata, if you can get your hands on it, Spina in Euro Industrie Park has it sometimes) gewickelt around them, after frying the balls though! Other nice combi is with a cube of cheese (mozzarella or some Bergkäse that will melt) inside. Yum! A great looking dish(pittole?) as has already become usual for your site. Marvel at your photos. Are you shooting in all natural light? I always seem to be shooting at night and struggling. Nice one. We'll have to try with the cheese inside, especially since Bergkäse (aus dem Felsenkeller - this one we buy at Kaufhof, Marienplatz) is one of our favourite cheeses. Don't know why, but your post pics aren't appearing in the RSS feed, i think you need activate the full article, instead of the summary/partial content. One image speaks for a thousand words, right? i just checked your rss, and it is still partial content, don't know if the feed address is correct: "https://www.deliciousdays.com/rss/". In my version of wordpress, that option is enough, but it probably needs you to publish something afterwards. These look so delicious -- the perfect wine nibble. And I want to prepare them for guests tomorrow....but could you clarify a couple of points in your recipe (I am like you: I become relentless in developing my own recipe to recreate a certain taste memory.)? 1) "fresh yeast" -- it's not available here, I've never used it -- any reason why I can't use dry for this recipe or any recommendations? ; 2) frying -- are you pan frying or deep frying (does "swimming" mean floating or the backstroke?)? 3) What temperature should the oil be? Are the dough balls crispy? 4) Have you tried cheese inside, as suggested above, or flavoring the dough itself with herbs and/or garlic? 5) Are you sorry you have a comments section for cooks trying to cook dishes they have never even seen? Any help you can give, I think all your readers attracted to this recipe will now be making it this week! You can email me or comment THANKS! 1) I've never worked with dry yeast much, but I don't see a reason why it shouldn't work. 2) It's more like deep frying, the oil should be at least two fingers deep. 3) No, not crispy, they'll be soft. The oil should be on medium to high heat, never actually double checked the temperature with a thermometer. If the pieces turn dark too quickly, it's basically too hot. 4) No, I've not yet attempted to additionally flavor the dough, but we used small cubes of mountain cheese to fill them (like Hande suggested), very yummy! First of all, I just want to say what an amazingly beautiful blog! Great job! Yolan, Per Hande's recommendation (above) we did try them with a bit of mountain cheese stuffed inside and they turned out great! I realized after returning to your website that I had never updated you after your kind help with this recipe. Let's just say, you and your recipe started off the dinner party with a bang. I did a lot of research on the web to track down more info on this dish (I always like to compare different recipes, especially when approaching an "authentic" dish, then pick and choose based on my experience/confidence), but I was still going in without a sure picture of my final product. I added garlic to the oil just to give it a bit of flavor (better garlic cardboard, if the worst occurred) and braved my fears of deep frying. My guests loved them; indeed, you ruined some appetites for the entree. I'm glad I saw this recipe again, because it was one I wanted to work on some more. Thanks again! These are highly addictive! My boy-friend's mother prepared them for us, I almost had to skip the main course. So good! Thank you for sharing. It's a simple and great snack. Hi Nicky, I know this is an old recipe. I hope, you read (and maybe answer) this comment. I've always read/heard that olive oil is not adequate for frying (because at high temperatures it loses its flavour). Do you think, that it makes a difference if you just use some sunflower oil?